We found the perfect home for your favorite fresh-cut flowers, and it has everything to do with this Newcastle vase! Adorned with gorgeous garland cuts and unique upright cuts, this versatile vase showcases a traditional shape that will easily match any pieces that are already part of your beloved Waterford collection. Keep this lead crystal beauty for yourself or give it to a loved one for an unforgettable gift. Dimensions: 6-1/4"L x 6-1/4"W x 12H. 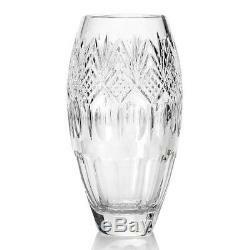 Waterford Crystal Newcastle 12 Garland & Upright Cut Vase. This item is new and has never been used. The box is damaged and was opened to verify no damage to content. Condition: New other (see details) What's in the Box: One Crystal Vase Packaging: Retail Packaging (Damaged). Packages are insured and include tracking at no additional cost. If you would like another size or style please place that order from the inventory available online. Every single customer is important to us and we appreciate the opportunity to assist you with any issues directly. The item "Waterford Crystal Newcastle 12 Garland & Upright Cut Vase" is in sale since Friday, August 17, 2018. This item is in the category "Pottery & Glass\Glass\Glassware\Waterford". The seller is "worldsbestdeals" and is located in Minneapolis, Minnesota. This item can be shipped to United States, Canada, United Kingdom, Denmark, Romania, Slovakia, Bulgaria, Czech republic, Finland, Hungary, Latvia, Lithuania, Malta, Estonia, Australia, Greece, Portugal, Cyprus, Slovenia, Japan, China, Sweden, South Korea, Indonesia, Taiwan, South africa, Thailand, Belgium, France, Hong Kong, Ireland, Netherlands, Poland, Spain, Italy, Germany, Austria, Israel, Mexico, New Zealand, Philippines, Singapore, Switzerland, Norway, Saudi arabia, Ukraine, United arab emirates, Qatar, Kuwait, Bahrain, Croatia, Malaysia, Brazil, Chile, Colombia, Costa rica, Dominican republic, Panama, Trinidad and tobago, Guatemala, El salvador, Honduras, Jamaica, Antigua and barbuda, Aruba, Belize, Dominica, Grenada, Saint kitts and nevis, Saint lucia, Montserrat, Turks and caicos islands, Barbados, Bangladesh, Bermuda, Brunei darussalam, Bolivia, Ecuador, Egypt, French guiana, Guernsey, Gibraltar, Guadeloupe, Iceland, Jersey, Jordan, Cambodia, Cayman islands, Liechtenstein, Sri lanka, Luxembourg, Monaco, Macao, Martinique, Maldives, Nicaragua, Oman, Peru, Pakistan, Paraguay, Reunion.